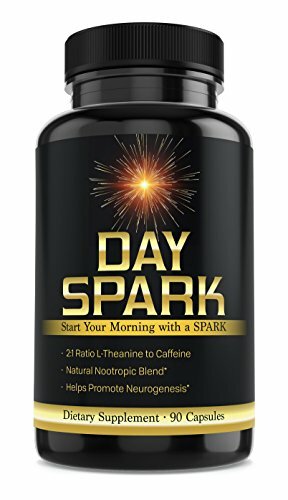 Day Spark is an all natural nootropic blend that I formulated for myself and clients to help jumpstart the day with ingredients that really make an impact on cognitive performance and general energy production. Day Spark came from actual trial and error testing to see which ingredients would have the most positive impact for cognitive performance and energy while keeping the cost down. This is not a pre-workout supplement even though I recommend a morning sweat after it is taken( I will explain more below). I made Day Spark to help users incorporate quality morning habits that will help them start the day feeling energetic and clear headed so they can take the day on with authority and perform their best physically,mentally,and emotionally. How we start our day really sets the tone for the rest of the day. The ingredients and the specific dosing were put together by years of experience with everything on the list below and from research from top neurologists in the field of natural nootropics for health and performance. The plan was to get all the biggest bang for the buck ingredients to make a product that really works and that you can feel the difference the first time you take it. Also everything that makes up the formula is proven to have a neuroprotective effect long term on the brain and even help promote a healthy circulatory system and immune system. With a 2:1 ratio of L-Theanine to caffeine, you get a mild stimulating effect(same as a Starbucks coffee) without any of the jitters. The rest of the formula is packed with amino acids, powerful antioxidants,adaptagens,and key nutrients to help promote neurogenesis in the brain and mitochondrial energy production. The doses were finalized with safe long term use in mind without risk of dependency. Day Spark-Scientifically formulated natural nootropic to help start your day with more energy and focus! -Chinese Club Moss thought to be a cognitive enhancer that can ramp up acetylcholine production in the brain. Day Spark is intended to help you start your day with energy and focus. The formula will both give you direct feedback with its mild stimulating effect and promises long term quality brain function due to the neuroprotective effects of the ingredients. From user feedback and my own personal experience, everyone seems to feel the mild stimulating effect within 20 minutes or so. Then a compounded effect in the coming weeks of better energy, clarity, and better cognitive performance. Day Spark was designed to benefit users with or without exercise. That being said, I recommend using it as part of a quality morning routine to get the most out of it. I don't want to just throw a supplement at customers and have them use it as a bandaid to a poor lifestyle. A quality morning in my opinion starts with a good nights sleep and then a quality morning routine with a positive mindset. The science is clear of the benefits of a morning sweat. The big benefit among many others is the activation of BDNF(brain-derived neurotrophic factor) in the brain. BDNF is like miracle grow for the brain. The ingredients in DAY SPARK can help activate BDNF. Now you add exercise to Day Spark and you you get a compounded effect. Everyone should get movement in daily of coarse but if you get your heart rate up and sweat in the morning you will feel much more clear and focused with better energy for your day to come. My personal favorite is jumping rope. It can be as easy as 1 minute on-1 minute off for 10-20 minutes. Get heart rate up with a light sweat and your ready for the day! I have tried most natural nootropic blends and many pharmaceutical nootropics as well. Due to the possible dangers of using pharmaceutical nootropics like the racetam family long term, I only recommend natural nootropics for long term use. That being said, I have had great success with natural nootropics and putting my ego aside there is one product that I consider the benchmark-QUALIA. I know it seems crazy for me to speak highly of a competitor but I have used it with great success and have to be honest in praising a great product. The problem with Qualia is the price. I just personally couldn't afford using it long term since it costs $130-$150 a month depending on subscription or one time buy. Another successful natural nootropic product is ONNIT's Alpha Brain. This product even though it has many backers and even celebrities like Joe Rogan praising it, I honestly did not get much out of it in the month I used it but it is a solid product. The issue here is again price and the fact that it is nowhere as complete as Qualia or Day Spark. From the feedback of my clients and other users of Day Spark including my own experience, Day Spark gives you 75% of the benefit of Qualia for a fraction of the price. So if you don't mind the price, Qualia is a great product. If your looking for a great product at a great price that will outperform most other natural nootropics, then try Day Spark for 30 days with no risk since we offer a 30 day money back guarantee. I want as many people as possible to try Day Spark to see the benefits in energy and mental clarity. It is a great product that I stand behind 100%. Try a bottle of Day Spark for a month and if you don't get benefit you will be refunded. You have nothing to lose but poor starts to the day. So take the 30 day challenge. PURCHASE DAY SPARK HERE AND ENJOY!